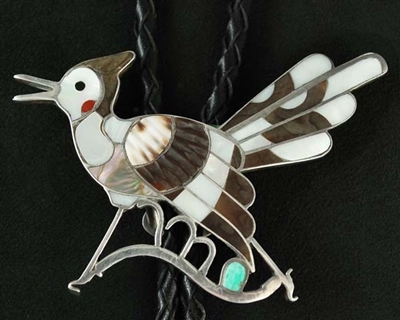 This beautifully crafted bolo tie is Zuni work by well-known artist Edward Beyuka. Set with materials of coral, carved turquoise, abalone shell, Mother of Pearl and carved cowry shell. 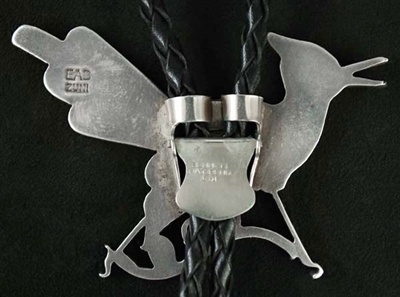 This lovely piece is one of the prettiest combinations of materials we have seen. The outstanding, precise inlay if just perfect on this roadrunner. 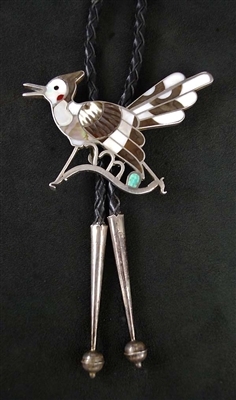 It measures 3" wide by 2" long with 2" long silver tips on a braded black leather. Hallmarked EAB Zuni.